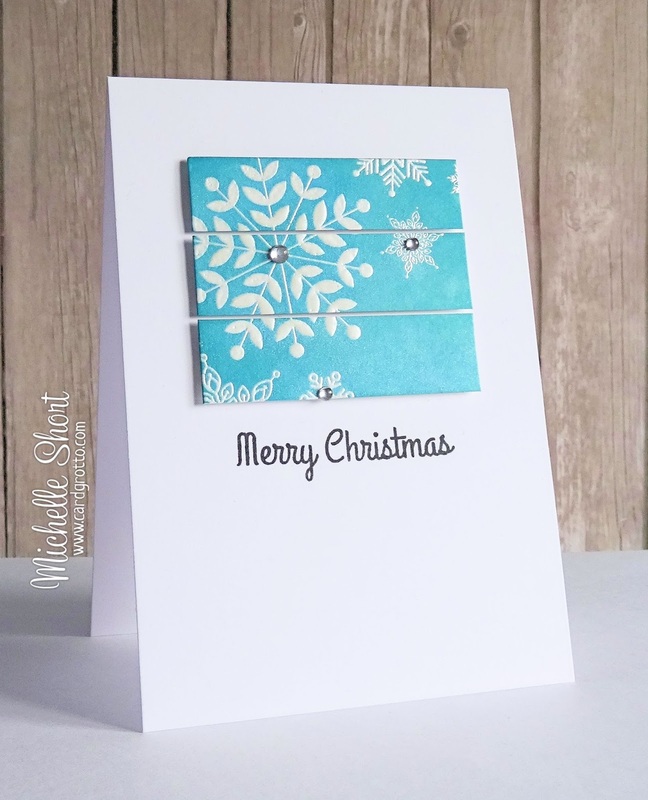 Hello there, today I have a card to share with you using the SSS Lots of Snowflakes set, I was kindly sent this set from Simon Says Stamp during the STAMPtember release and it really is a favourite of mine. I first took a sheet of Neenah 110lb CS (if I had realised what I would be doing with it I actually would have used watercolour paper but never mind!) and stamped the snowflakes on it using Vermark ink. I then heat embossed these using WOW! Silver Pearl EP. I went over the panel using TH Distress Inks in Tumbled Glass, Broken China, Evergreen Bough and Salty Ocean. I love that the embossing powder resists the inks. For a little shine, I took some Perfect Pearls and mixed it with water in a Mini Mister and sprayed this over the panel. Once dry, I cut this in strips and added it to a Neenah card base with foam tape. The sentiment, from the SSS Happy Hellos set, was stamped below using black ink. I finished off with a few HA smooth gems. Thanks you so much for visiting me today, hope you are having a lovely day! 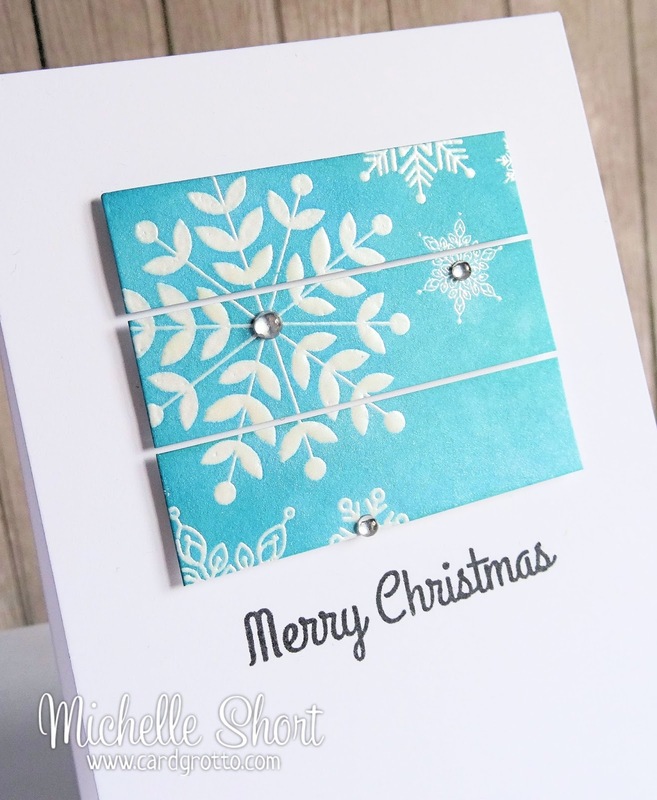 This is just GORGEOUS Michelle - LOVE those snowflakes and the extra oomph you gave it by cutting up the panel - LOVELY! Another fabulously stunning card Michelle. You are inspiring me to dust off my neglected TH Distress Ink pads with all your wonderful creations lately! This is stunning Michelle. I love the design and gorgeous colour. Love this card - especially the idea of cutting the panel in strips. It is so pretty - a perfect Christmas card. Looks like a lot of fun to make too! Wow! Your card is so beautiful. I LOVE it. Just wanted to say a big thanks too. I was your Clearly Besotted winner, in the blog hop, and my new goodies arrived from there this morning. I love everything about this, it's beautiful.